Close your eyes and think of Andy Warhol, Woody Allen and Johnny Depp. Can you see their glasses? They are from the traditional family-run business Moscot. All made by hand in 130 working steps (every acetate frame by Moscot is done that way). Zack Moscot is the fifth generation. The 26-year-old studied industrial design at the University of Michigan before becoming the brand's design director. He loves to create. His most successful models so far are "Frankie" and "Arthur" (for example worn by Jack Savoretti). 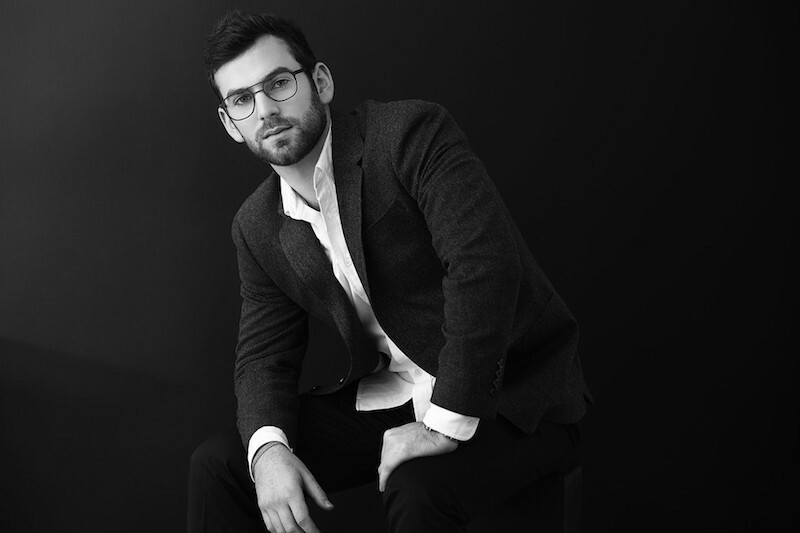 Zack Moscot is also responsible for cooperations with style-thinkalikes such as Mr Porter, Common Projects and Dover Street Market. Many more to come in 2018, he promised me on the phone. For spring he plans richer versions of best sellers. "It's going to be a gold campaign”, he added. But most important: "We are very technical with the fits”, Zack Moscot points out. All Moscot frames are made out of the best acetate materials: long lasting, resists all kind of temperatures. They come in different sizes and are adjusted to each customer. Now we asked the man who puts materials and classic style first about his 10 favorite basics – in terms of fashion and grooming. As a Moscot, I can’t live without our most classic frame, The Lemtosh. The best thing about my Lemtosh is that its suitable for all occasions, all outfits, and I can simply turn it into a sunglass with my Cliptosh! My commuter jacket (Levi's) is more of a rugged and flexible version of a classic denim jacket. I like its stretch ability which allows me to be active when I need to be. Also, I enjoy the fact that it is waterproof for those moments I get caught in the rain. It’s a great layering piece for all seasons and ideal for commuting to the office, and a must for traveling! This is my go to sneaker (Common Project) for work, play, and hanging out. The simplicity is right up my alley and I wear them with both jeans and trousers. The clean lines, effortless look, and assorted colors offered make them perfect for wearing to any occasion year-round. Music is sometimes the ideal way for me to express myself and without my guitar I’d feel a bit lost. I love my acoustic Alvarez; the neck is easy to navigate and the playability ease that comes with this axe is perfect for the type of music I like to create. Singing and songwriting is something I enjoy, and I certainly tend to favor this brand of guitars. Whether under a blazer or layered with the reversible bomber (by wings+horns|Moscot), a staple in my closet that I like to rock is my jersey tees. The Pocket Tee is most comfortable and fits in a refined yet relaxed way. The front pocket feature is key for holding my specs or my CLIPTOSH when I’m inside. As a designer, I enjoy the made to measure aspect of a tuxedo and the experience that comes along with making it. Tailored perfectly, and a go-to for special occasions, is my Todd Snyder tux. Their superior quality makes it easy when I need suiting options to get me to the more elegant events, specifically my wedding which is quickly approaching! Facial hair is a large part of my look and I’m not quite sure how I could maintain it neatly without using my beard trimmer. I never actually use a razor or go for the clean-shaven look, so having the proper trimming tool is essential. I rely on the Philips Trimmer ("Norenco") for achieving just the right amount of facial hair, so that in summers I can go shorter and in winters I can keep the beard a bit thicker. I use my rucksack (by Filson >>>) wherever I go. Just to throw in my computer, iPad, and other needed essentials. It’s ideal for everyday use, commuting, and traveling and always fits in with my overall style. I believe your scent is a part of how others perceive and remember you by. Since some colognes are too potent or tend wear off throughout the day, I like to wear oils that blend and develop on the skin. Frédéric Malle scents are sophisticated and evolve with your skin oils in a tasteful way. My favorite: Portrait of a lady.